The first time we looked at our house the hydrangea was just filling out with its new leaves. By the time we were moving in, towards the end of June, the flower buds were developed. I could hardly wait to see the color! I was also a little fearful, what if it was bubble gum pink? In that case it would have to go; a hydrangea is already out of place in the danger garden, no way a pink one could make the cut! Slowly the florets started opening, showing green tips, I was ecstatic! It couldn’t get any better. Then they started to turn blue, a nice bight clean blue. Not quite as nice as the green I thought I was getting but still, I could work with it. They darkened turning a deeper blue with a bit of violet, nice. But the center of the cluster wasn’t opening. That’s when I realized ours was a lacecap not a mophead. This new development took a little getting used to. I was slow to warm to the charms of the lacecap, I wanted the big lusty mophead. I came around, probably about the same time the bees did. They loved landing on the flat center of the cluster and hanging out. Then after a month of enjoying the flowers the unthinkable happened. Near the end of July the individual florets along the edge started to flop, bending over and down like they dropped something on the ground and were looking for it. Then the blue color drained away, seemingly overnight, to be replaced by a dusty mauve. Let me say it again, DUSTY MAUVE. Is there anything good to be said about this color? In high school my friend Terri had a dusty mauve colored winter coat, I was so jealous, god I wanted that coat. I got over it and left dusty mauve in the 80’s, now here it was again in my garden. The first year I thought I’d done something wrong. Had I somehow changed the PH of the soil? Was I not watering it enough and this was its death march? I researched, everything told me no, this is a normal part of the life-cycle. I resisted. I stuck every rusty nail I could find in the ground under the plant thinking that would help, no difference (but pity the person who digs this plant up someday, it’s now booby-trapped). It has repeated this same life-cycle sequence every year for the last 4 years. Right now it’s prime time, green turning blue with a little violet, just beautiful, and I still have a glimmer of hope that it won’t turn all 80’s on me later in the month. They are beautiful! I love pink so I'd probably love the dusty mauve too lol. Mental Note to Self: Get Loree a dusty mauve coat for her bday. With the caveat that memory is highly unreliable and prone to suggestion, I do believe that my lacecap hydrangea did this in earlier years, but it seems last year, it faded basically back to a pale greenish color after done blooming. Or that's just wishful thinking and denial, but that's how I remember it. 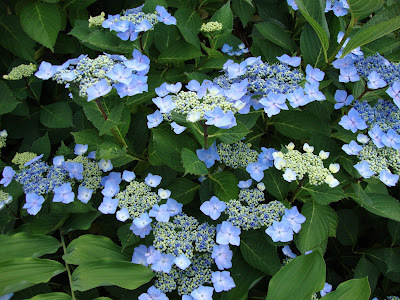 Lacecap hydrangeas... gorgeous! Those green turning blue that looks like little buds are so attractive. I love them! And of course the flowers at the sides. Thanks for not giving up on this plant. Nice pictures! MTJ, I'll take a picture "if/when" they turn the dusty mauve and you'll be able to judge the color for yourself. DS, Yes please do, then I'll already have your Christmas gift for this year! Megan, you give me hope! I will cling to it.